Barbie has long been a name synonymous with the ideal standard of beauty for many girls growing up in the U.S. Introduced nearly 60 years ago, the doll has been problematic for exactly that same reason for almost as long: facing criticism of being hypersexual, promoting unrealistic body expectations and sorely lacking in diversity. Perhaps that’s why the announcement Monday from U.S. Olympic fencer Ibtihaj Muhammad that manufacturer Mattel was releasing its first hijab-wearing, African-American, Muslim Barbie doll in her own image filled me with equal parts pride and wonder. Bronze medalist Muhammad, the first Muslim woman to win an Olympic medal for the United States, unboxed the doll at the Glamour Women of the Year Summit in New York. Clad in a crisp white fencing uniform complete with saber, helmet and white headscarf, the doll is part of Barbie’s Shero collection, which recognizes women “who break boundaries to inspire the next generation of girls,” according to Mattel. I remember well one of the last Barbie dolls I coveted. Dressed in a canary yellow tee, fuchsia jeans and aqua blue hiking boots, Camp Barbie represented the epitome of cool to my 10-year-old self in 1993. Sporty and chic, her yellow sunglasses complemented her purple backpack-turned-sleeping bag adorned with glow-in-the-dark stars. Her name was Midge, and she was introduced by Mattel as Barbie’s best friend. Best of all, her strawberry blonde hair changed colors in the sun, or so the box promised. But in my household, that of a preteen African-American Muslim girl growing up on the South Side of Chicago, the odds that I would be able to bring her home were slim. The hitch: My mother was adamant about raising her three daughters with a healthy sense of self that included images and toys with hair and skin that resembled ours. I considered myself a Barbie aficionado, collecting all the black versions of the doll I could get my hands on: from Totally Hair Barbie, whose long, textured strands reached all the way to her heels, to Babysitting Skipper, whose bouncy black curls rivaled those of the three baby dolls she accompanied. But black Barbie dolls were hard to find — practically nonexistent in neighborhoods outside of majority-black areas, or relegated to a dusty corner even in the stores that did sell them. Still, those dolls often were not the newest and coolest and, crucially for my 10-year-old self, not available with skin that looked like mine. I may not have appreciated at the time my mother’s push to ensure my dolls looked like me. As an adult, I now get it. It represented one of the few avenues in which she had the power to curate the images her children were seeing and the faces that would help color our imagination. Even if the commercials of my childhood never explicitly negated my worth, they paraded women with silky brunette, blonde or strawberry blonde hair in their shampoo, makeup and clothing ads. Even if the magazines geared toward my younger self claimed to be for all girls, they rarely featured any who looked like me. Perhaps that’s why the symbolism of Muhammad’s announcement was not lost on my peers and I who noted, with awe, that the first Muslim, hijab-wearing Barbie is also black. Her announcement comes at a time in which the erasure of African-American Muslims seems particularly pronounced. A time in which a major black women’s lifestyle magazine released a list of “100 Woke Women” and yet couldn’t seem to find one woke African-American Muslim woman to include among them. This erasure reinforces the idea that Muslim equals Arab, South Asian, immigrant, anyone other than an athletic, Olympic medal-winning black woman from New Jersey — one with a modest clothing line, hundreds of thousands of social media followers and now a Barbie in her likeness. The introduction of this doll lends support to the reality that a black Muslim woman can be both authentically American and authentically Muslim. A notion driven home by statistics that estimate a significant percentage of the enslaved Africans brought to this country were Muslim. In a week when one of the most widely shared articles about hijab on my social media feed involved a Tennessee teacher posting Snapchat video of her young student’s headscarf being pulled off, along with captions “pretty hair” and “lol all that hair cover up,” Barbie’s latest edition goes a long way toward reinforcing the notion that beauty can be defined in myriad ways, including with hijab. 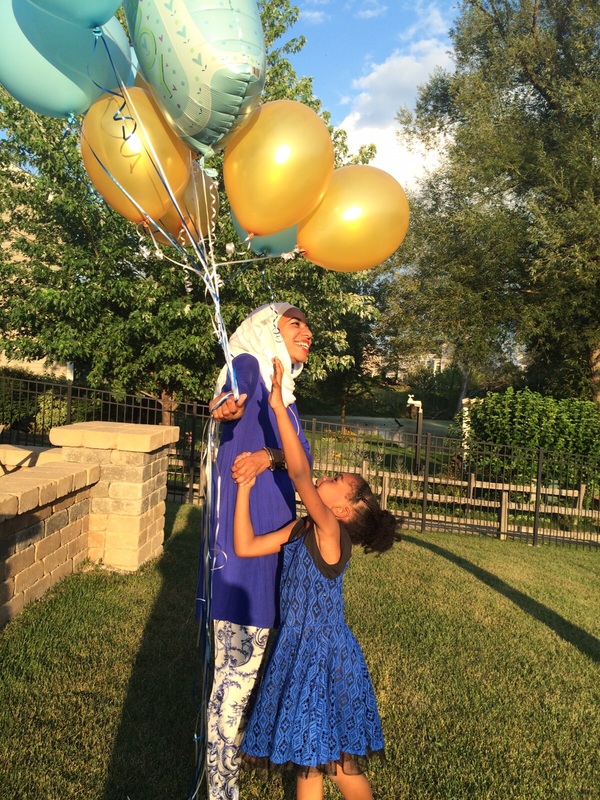 Malika Bilal with her 8-year-old niece, Hana. Most of all, Muhammad’s announcement matters because representation matters. It matters to the many girls and young women who’ve messaged me over the five years I’ve co-hosted a daily talk show, as my channel’s first — and only — woman in hijab to do so. Their messages are full of encouragement and a sense of wonderment at being shown that a career path like mine is possible. And it matters to those around the world who witnessed two black Muslim women in hijab on their television screens as I interviewed Muhammad before an audience of millions of households, days after the New Jersey fencer learned she had qualified for the U.S. Olympic team in 2016. Among those watching, there could very well have been a young girl who will now aspire to enter sports, and fencing in particular, because Muhammad placed that dream on her radar. Because beyond the image of a gorgeous hijab-wearing doll, Muhammad’s Barbie is athletic and unapologetically so. It’s not just young girls who are representation-starved. Grown women like myself, and the many who’ve retweeted, reposted and reblogged the Barbie announcement, are just as excited, not just for the next generation of girls but also for ourselves. Recently on a visit home to Chicago, my 8-year-old niece insisted upon showing me her new Barbie dolls. In her possession were members of the Fashionista line, featuring Barbie and Ken dolls in various shades of brown and black, and a range of body types — some slim, others thick. A Barbie with an Afro, a Ken with cornrows. Although I’m firmly in my 30s and have long since put away my toys, I couldn’t help but be a little wistful that options like hers did not exist when I was her age. So when the Ibtihaj Muhammad Shero Barbie goes on sale in 2018, I’ll be ordering one to add to my niece’s collection. But I’m not ashamed to admit that another one just might find a home in my house as well. Malika M Bilal is co-host of The Stream, an Emmy-nominated TV news talk show on Al Jazeera English.